Lighter Amarok pips Merc in sprint tests to remain fastest double cab in SA. 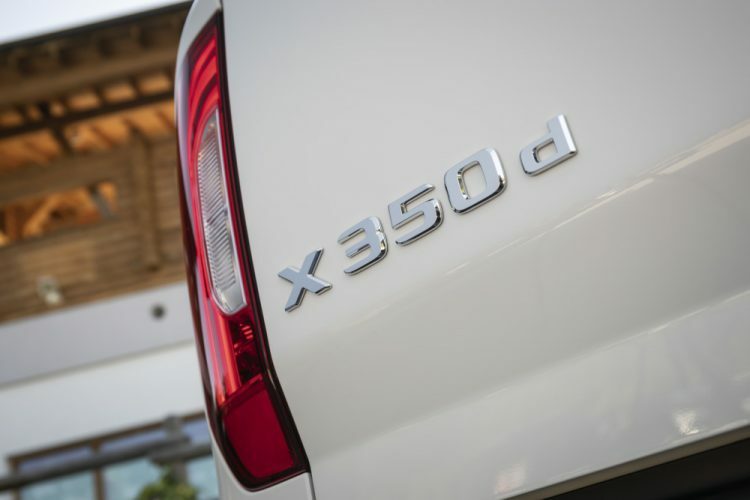 You would think that having South Africa’s most powerful and the most expensive diesel double-cab bakkie, in the Mercedes-Benz X-Class 350d 4MATIC in Power trim, on test, would make for an easy story to write. 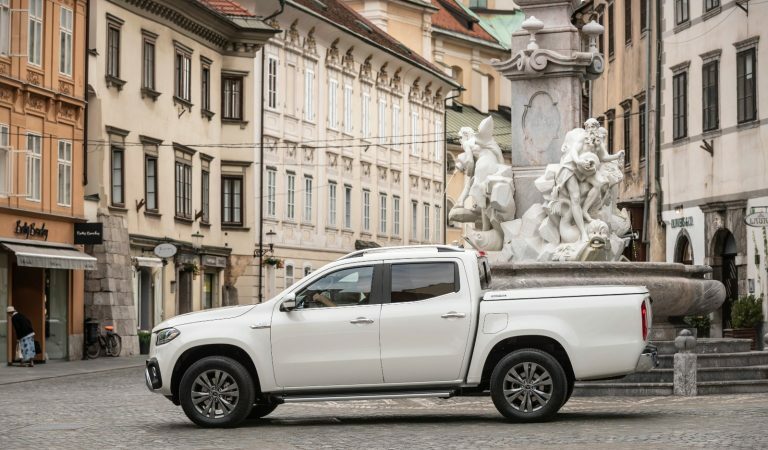 I wish this was the case, but when you are paying R973 188 as a suggested retail for this top-of-the-range offering, before you add a single item from the long options list, then putting this bakkie into perspective versus the competition becomes rather important, and a whole lot more difficult to write. I said it just last week, the only market segment that is showing decent growth is the compact SUV segment, and this is followed closely by the demand for lifestyle-orientated double-cab bakkies. And if you think about it, owning a car like a spec bakkie these days makes perfect sense. South Africa’s roads are not in great shape, the elevated ride gives many a perception of safety, you can tow almost anything, and you have space for the family and a full one-ton of their luggage. So, here it goes. Is this the best bakkie in South Africa? And how bad do you want that three-pointed star emblem on your front grill? I will touch on the elephant that is always in the room when it comes to the X-Class. Yes, this Mercedes-Benz bakkie is pinned very much on the Nissan Navara. And in the lower spec 250d, I really didn’t like the Nissan engine-gearbox combination fitted in this model. But for the 350d here, there is a whole lot more premium stuff happening in this department, with the engine and gearbox being pure Mercedes-Benz offerings. The Mercedes-Benz 3.0-litre V6 turbodiesel engine produces 190kW of power and 550Nm of torque spread from 1400 rpm to 3200 rpm. 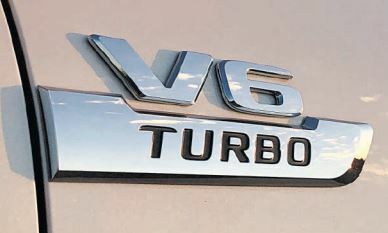 The previous power king, the 3.0-litre V6 Amarok, makes 25kW less, but produces the same torque. The engine feels strong, but this didn’t translate into a sense of the 350d actually being fast. This feeling is amplified by the throttle being rather dull when gently prodded at lower speeds or off the line. When I ran the 350d at Gerotek to see just how fast it was, the numbers coming back from my Racelogic VBOX were telling me that the Mercedes-Benz was, in fact, slightly behind the Amarok from the word go, and in every roll-on acceleration segment too. But before you say there must have been something wrong with the 350d, I need to remind you that the Mercedes-Benz is a full 250kg heavier than the VW, and for me, lugging this substantial amount of extra weight around is the reason for the numbers I got. 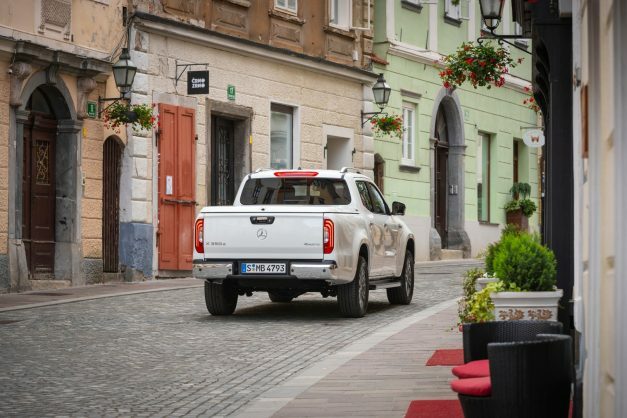 The off-the-line numbers came in like this: 0-100km/h in 9.43 seconds (Amarok: 8.76 seconds); the quarter mile in 16.98 seconds (Amarok: 16.32 seconds); the half mile at 166.37km/h (Amarok: 167.49km/h), the 1km at 173.16 km/h (Amarok: 175.08km/h); and then in the roll-on from 60km/h to 140km/h, the 350d took 12.60 seconds (Amarok: 12.31 seconds). So, the bottom line is, VW’s Amarok 3.0 TDI remains the fastest double-cab in South Africa. Something else worth considering, the 350d is fairly economical when driven in the real world and used 11.5-litres per 100km, versus the claim of 9.0-litres per 100km, while I had it for the week. A final side note, and perhaps a bit less relevant, is that the 350d hits its electronic speed limiter at 204km/h and the Amarok was stopped at 194km/h. 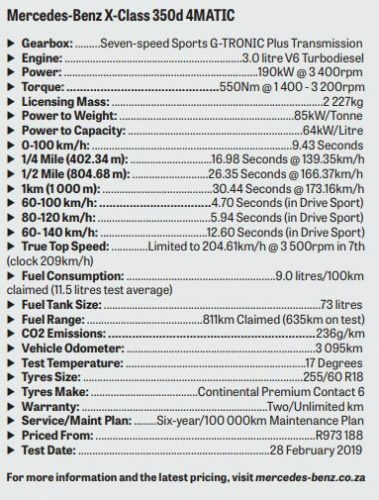 And we all know that just about every double-cab owner is keen to “race” his bakkie against anything, and this information might be of value. The standard 7G-TRONIC PLUS automatic transmission, with steering wheel shift paddles, does a better job than the Nissan offering, and makes for easy driving on the open road. Generally speaking, there is a decent amount of room inside the 350d, but my children didn’t enjoy the slightly cramped and raised rear seats. And then, although it makes for a very neat and functional interior, I didn’t like the lack of storage space around the console area for the likes of your phone and wallet. The only other complaint I had was that there is no reach adjustment for the steering wheel, and even when seated in the lowest position, I couldn’t adjust the steering up far enough. Obviously being a proper lowrange bakkie, going off-road, anywhere, would be all too easy, as I found out when I drove the 350d at its international launch last year. Thanks to the DYNAMIC SELECT system, you get the choice of five driving modes: Comfort, Eco, Sport, Manual and Off-Road. You also have the 4MATIC permanent all-wheel drive system doing its bit. And here, you get a further three all-wheel-drive modes to choose from: 4MAT for increased vehicle dynamics; 4H for improved traction off-road; and 4L for tough off-road terrain to comprehensively take care of any bundu bashing needs. 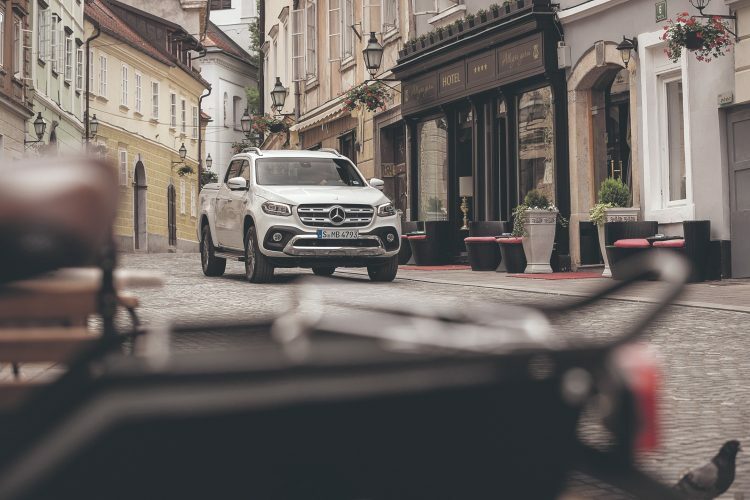 Carrying a Mercedes-Benz badge also means that you get a full house of comfort and safety features that are hard to match in the bakkie segment. And if the standard offering is not enough, you can opt for a brace of optional safety systems like Active Brake Assist and Lane Keeping Assist. Other standard features are a chrome-plated under-ride guard in the front bumper; a chrome-plated rear bumper; 18- inch six-spoke light-alloy wheels; LED High Performance headlamps; electrically adjustable seats; and an Audio 20 infotainment system with a multifunctional touchpad. Is it the best bakkie on the road today? No. Is it the worst? Not by a long shot. But this is a massively competitive segment, you have so much choice in terms of models and pricing, and everybody who plays here is desperately after your money. It does command a presence on the road. You do feel the weight of the 350d when driving it. Not loved by the passengers in the rear. This is no run-of-the-mill bakkie, but you would really have to want that badge in order for you to just hand over R1 million for the MercedesBenz X-Class 350d 4MATIC.